A charity local to the Magicard Headquarters in Weymouth, UK is set to benefit from a year of team fundraising. We have sponsored Weldmar Hospicecare in Dorset with a donation of £2,000 and we pledge to match that through fundraising by Magicard’s 2nd birthday in August 2018. 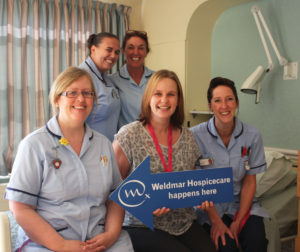 Weldmar Hospicecare is a charity that provides end of life care for people living in Dorset who need specialist support. race events, The Colour Run 2018. Magicard will be hosting various internal events and a team of 15 people have signed to take part in the Weymouth Half Marathon in 2018 – the 13.1 mile race will take place in March and will take runners along various stretches of Dorset coastline. Debbie Clark HR Manager at Magicard said: “As a team, we held various discussions over which local charity we’d like to work with – and Weldmar Hospicecare came out on top. “We’re looking forward to our smaller internal events, but the two big racing events have really got the team talking and planning their training regimes for the coming months. “It gives you a little bit more motivation when you have a charity such as Weldmar Hospicecare to raise money for”. Prior to the two running events, Magicard will be calling upon supporters to help to raise funds for such a deserving charity by sponsoring the team as they embark on the half marathon and 4KM Colour Run.